Did you know that a tomb originally intended for Napoleon’s son is sitting in a Canadian cemetery? 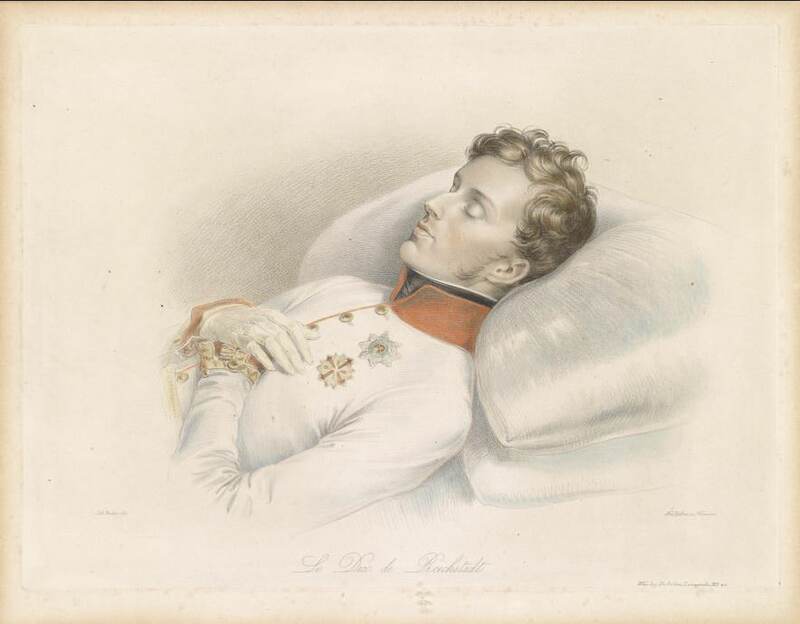 Napoleon’s son, otherwise known as Napoleon II, the King of Rome or Duke of Reichstadt, died of tuberculosis in Vienna on July 22, 1832, at the age of 21 (see my article about his death). Since his mother, Marie Louise, was the Duchess of Parma, a burial monument for the young man was constructed in Italy. When the Duke of Reichstadt was interred in the Habsburg family crypt at the Capuchin Church in Vienna, the Italian monument was left unused. Venner thought the tomb for Napoleon’s son would make a lovely mausoleum for his family. He bought it for a sum approaching $50,000 and had it transported to Canada in pieces. It arrived in Quebec City in 1858. The Italian monument, in white Carrara marble, consisted of a sarcophagus topped with a statue of a grieving Greek goddess and a draped urn. Venner hired local architect and engineer Charles Bailliargé to design and build an even grander monument, incorporating the Italian tomb. Venner wanted it installed at the recently-opened Catholic cemetery of Saint-Charles, which had also been laid out by Bailliargé. Built with Montreal stone, the monument resembles a small Corinthian temple. It is composed of six columns covered by three stacked pedestals decorated with carved laurel crowns, surmounted by the Italian urn. The whole thing rests on a thick, high pedestal decorated with bas-relief motifs. Bailliargé engaged skilled craftsmen to carve wooden models to guide the stone cutters. The Italian statue was placed in the centre of the temple. A crypt was constructed underneath, large enough to hold 30 lead coffins. A stone and iron fence was erected around the perimeter, precisely matching the fence Baillairgé was putting in front of the Cathedral of Notre-Dame de Québec. (2) The iron gate is ornamented with spirals and circles. Sadly, the Mediterranean goddess succumbed to the Quebec winters. In the early 20th century, the original marble statue was replaced by a bronze Sacred Heart of Mary statue, made in France. In 1876, William Venner married his second wife, Philomène Langevin (b. 1843). Venner died on October 27, 1890, at the age of 77. He and many other members of his family are buried in the crypt. One of Venner’s sons, also named William (1836-1905), was suspected of being involved in the assassination of Canadian politician Thomas D’Arcy McGee in 1868, though he was never accused of the crime. (4) One of Venner’s granddaughters, Irma LeVasseur (1878-1864), was the first female French Canadian doctor. The tomb remains the property of Venner’s descendants. If you would like to see it, the old part of Saint-Charles cemetery is at 1120, Saint-Vallier Ouest in Quebec City. 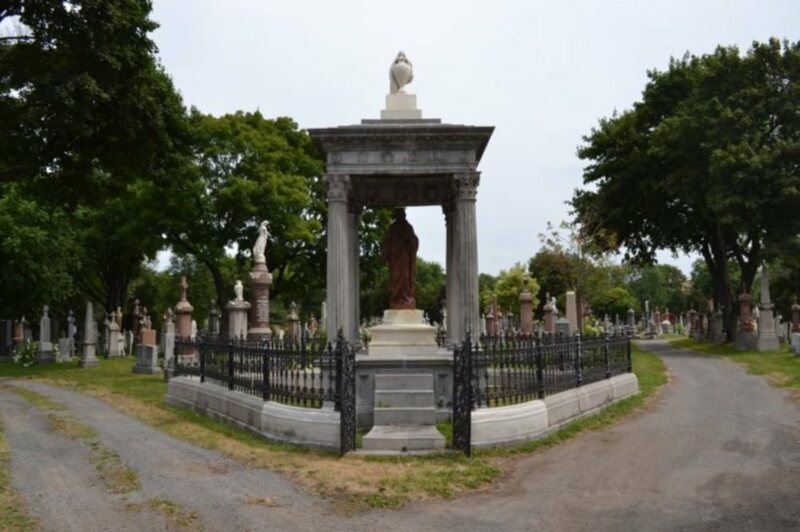 There are more photos of the Venner monument on the Culture et Communications Québec website. As for Napoleon’s son, his remains were transferred to Paris in 1940, a gift to France from Adolf Hitler. They rested for a while beside those of Napoleon in Les Invalides, before being moved to the lower church. The Duke of Reichstadt’s heart and intestines remained in Vienna, where they reside respectively in urns at the Habsburg Heart Crypt (Hofburg Palace) and the Ducal Crypt (St. Stephen’s Cathedral). Pierre Prévost, “Tombeau royal pour un fils de Saint-Gervais,” Au fil des ans: Bulletin de la Société historique de Bellechasse, Vol. 21, No. 4, Automne 2009, p. 20. Christina Cameron, Charles Baillairgé: Architect and Engineer (Montreal and Kingston, 1989), p. 109. Jean Langelier, The Quebec and Lower St. Lawrence Tourist’s Guide (Quebec, 1875), p. 130. Jean-Marie Lebel, “Dans un cimetière de Québec, le tombeau de l’Aiglon,” Cap-aux-Diamants: La revue d’histoire du Québec, No. 81, 2005, p. 43. As a French-educated American with a PhD in history, I must warn one and all: the best general in the history of France was Joanne of Arc. The worst general was Napoleon. Thanks for commenting, Will. “Who was the best general?” always engenders lots of debate. I admire both Napoleon and Joan of Arc. Very interesting article, but you might want to change the 1840 date into 1940 for the transfer of the Aiglon’s remains to Paris … ! What a strange judgement,a Ph.D.in History does not qualify you as a military expert!! And besides,the article was not about Napoleons military status,it was about tombstones! And Hi Shannon, interesting and practically unknown! I never knew that Marie- Louise had a tombstone done for her son. Thanks, Irene. Neither did I, until I came across a reference to Venner bringing it to Quebec. Thanks again Shannon for these little nuggets of history! Wonderful story; it is comforting to know that there is a part of the Napoleon II legacy here in North America. Thanks, Tom. I think so too. Thanks for posting this about Nap’s son, France’s “Little Lost King”. RIP Napoleon II! My pleasure, Jean. Glad you enjoyed the post. Adolf Hitler made a gift to France in 1840? Hmmmm.. 😉 Great article, thanks Shannon. Thanks for the comment, Vince. I knew someone would step up for Napoleon. Napoleon the third son Prince Imperial Eugene of France is in South Africa Kwa-Zulu Natal drift. Where he was killed in the battle field- Sandlwana. Thanks, Emmanuel. There’s information about the Prince Imperial monument here: http://www.battlefieldsroute.co.za/place/prince-imperial-memorial/. History is Past, Dead and Gone, but it keeps rejuvenating itself. Thanks for info. You’re welcome, Muhammad. Thanks for commenting. As with most references to and about Napoleon, I always reflect to that first time being in the courtyard at Fontainebleau, June 1979, when imagining Napoleon bidding farewell to the remaining faithful officers of the Old Guard… your article resonates deeply with me – I am but an old history under-graduate who has traveled the environs of France from north to south; and back again, in wonderment of the remaining Napoleonic markers – and now, thanks to your article, another known marker practically in my own backyard. Thanks, Frank. I’m glad the article evoked that Fontainebleau memory for you. I, too, have stood in that courtyard, imagining Napoleon’s farewell. Would love someday to do the whole Napoleonic tour of France, the way you have done. A few years ago I went on a guided tour of Les Invalides, and found the entire experience awesome. But nobody mentioned that the remains of Napoleon’s son were transferred to Paris in 1940 and certainly nobody mentioned that the gift to France was from Adolf Hitler. Thank you. 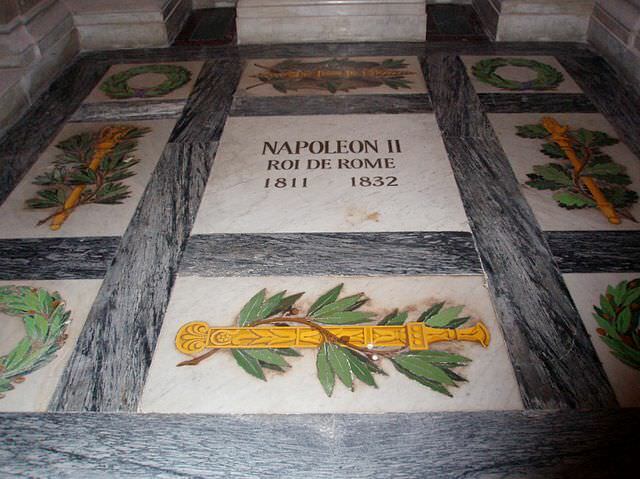 Next time I am visiting Napoleon in Les Invalides, I will look for a monument to the King of Rome in the lower church. You’re most welcome, Hels. I don’t imagine the Hitler connection is one they would trumpet. Can you direct me to a source or sources that explain or refer to why William Venner was suspected of being involved in the assassination of D’Arcy McGee? This is referred to in the Prévost article cited above, though no details are given as to why Venner was rumoured to have been involved. Wonderful article my dear Shannon….thank you for all your research and hard work in bringing us these magnificent stories . You’re most welcome, Shasta. So glad you’re enjoying them. There are some fine and costly monuments to be seen in this cemetery, and the visitor shall not fail to notice that erected for the family of W. Venner, esquire. The statue is a splendid piece of sculpture.